In November we held a Christmas Wreath Making Workshop run by member Liz Wright and her friend. The picture shows the amazing results. We also had the Radcliffe U3A Ukulele group entertain us. 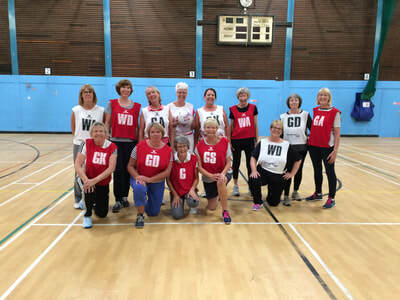 We have been lucky accepted to be part of the England Walking Netball association with the WI. We are collecting sleepwear for the Children's Cancer Wards at the QMC. This will be delivered by Jan Sanderson after our February meeting. 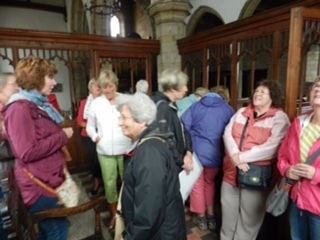 Dinah is organising another walk - this time it will be walking a 3km trailer around Newark looking at the many and varied Victorian Buildings. We meet at 10am Thursday 21st February by the bronze plaque at Newark Castle. 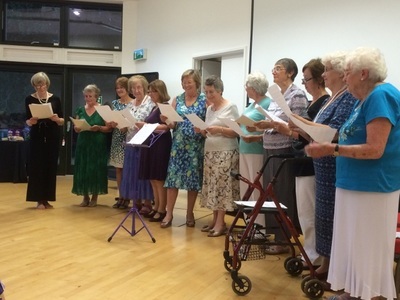 Group meeting is held by Burton Joyce & Bulcote WI An evening of Music and Fun! Group Meeting on Oct 11th 7.00pm. Just £5 includes light refreshments and a square dance! Tickets on sale next meeting. Christmas Shoe Box appeal – Children’s knitted hats, mittens, gloves and scarves are being collected (no other items can be accepted), if you would like to contribute. Age ranges are 2-4, or 5-9, or 10 & above. County House needs them by Mon 22nd October. 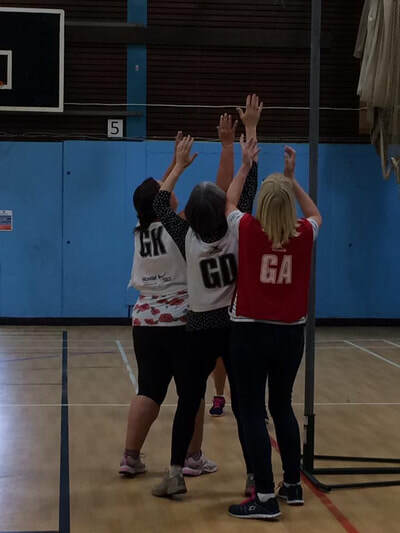 Denman Weekend with Notts Fed - June 14th-16th 2019. Deposits by Monday 21st November to book your place. We are still collecting Stamps and plastic bottle tops. This months meeting in Oct 4th is Ann Featherstone will be sharing her knowledge of Victorian Crime with us ‘From Baby Farmer to Acid Bath Murderer’! We have had a busy few months in our 90th year. May saw us holding a film afternoon at the Grange Hall in Radlciffe. We watched Singing in the Rain and had tea and cakes. In June we had a Pottery Workshop, some of the members were able to try throwing a pot. June was also the month two teams entered the County Quiz. This is another fun evening with questions for all. July was the Shelford Street Market - on a very hot day we held a cake stall and Jam Jar tombola. 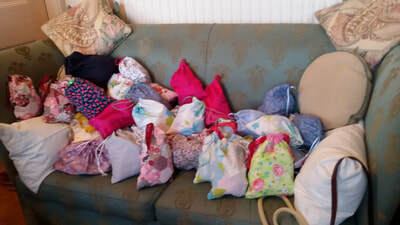 Our members did us proud by filling over a 100 jam jars with a variety of contents from slippers, soaps, chocolate to coins. It went down very well. 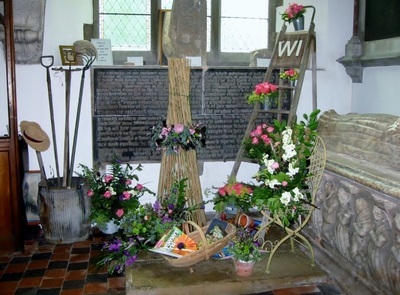 Our president Liz with the help of Dinah produced a lovely flower arrangement based of wild flowers in the Church. August two of our members joined Burton Joyce Kurling - we were made very welcome and have a very fun evening. 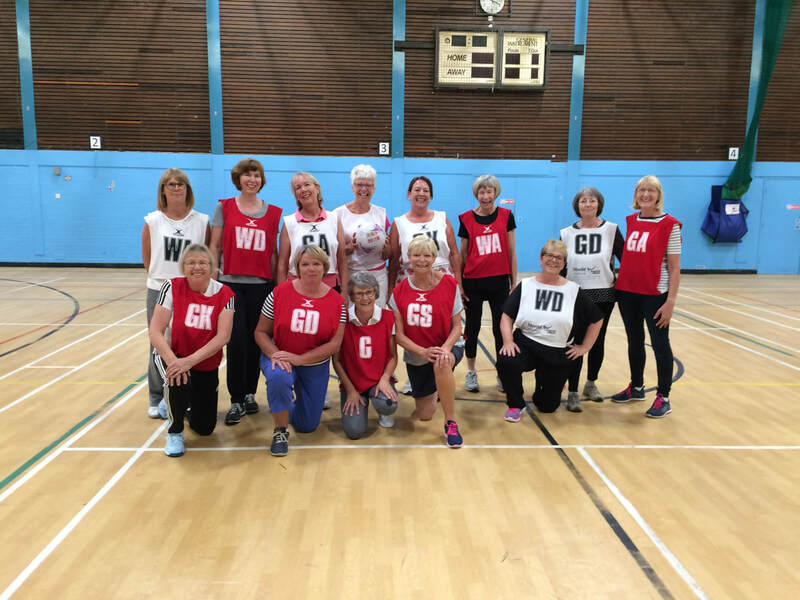 playing walking netball. We all enjoyed it so much we are planned on continuing. Apologies for not updating the website. The Darts pairs competition was cancelled due to a flood at the venue. 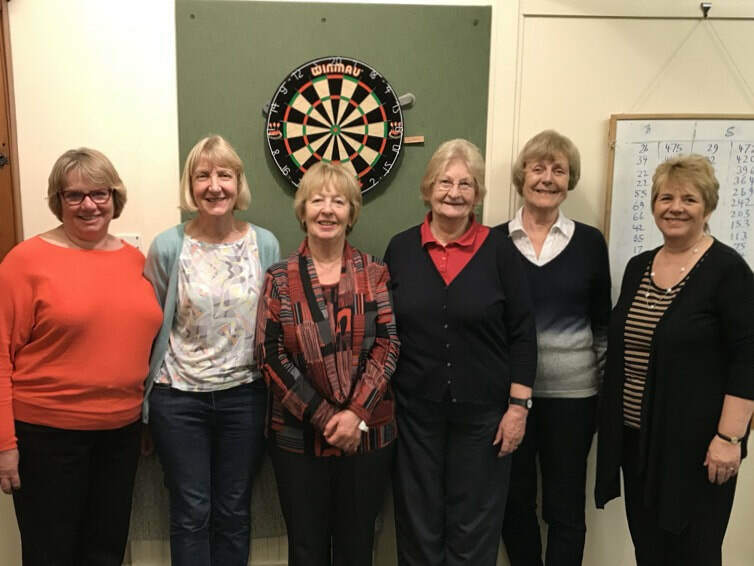 Although Shelford darts team did win our league and went on to the finals at East Bridgford, unfortunately we were not so lucky on the night. March meeting had to be cancelled due to the bad weather. 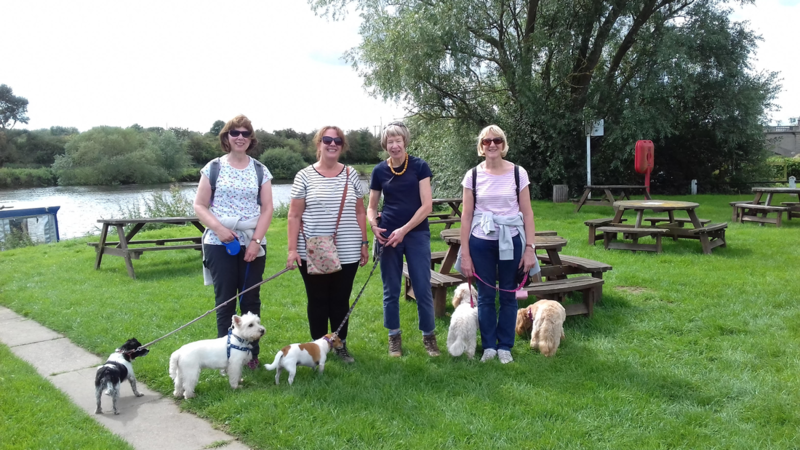 We had another walk organised by Dinah from Gunthorpe to Ferryfarm and back. 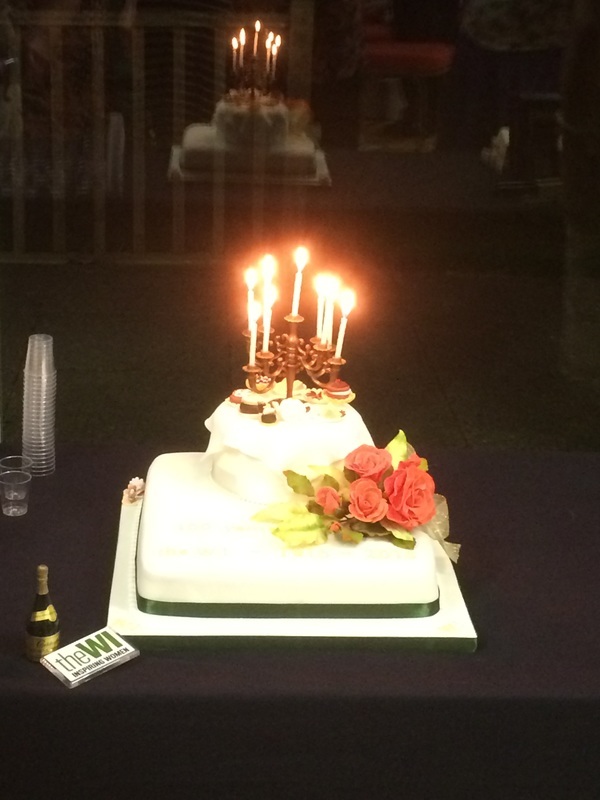 We did have our 90th birthday dinner at The Thatch at Bottesford, highly recommended, we all had a lovely meal. April19th was our group meeting where we were joined by East Bridgford, Gunthorpe, Burton Joyce and Bulcote members. The speaker was Charles Hanson who gave an interesting and amusing talk on antiques. May meeting is second Thursday to avoid any elections they may be on. We discuss the resolutions prior to voting, ready to pass the outcome to our representative to vote on our behalf at the national AGM. May also sees our birthday film afternoon at the grange. where in true WI fashion Tea and Cake will be served. 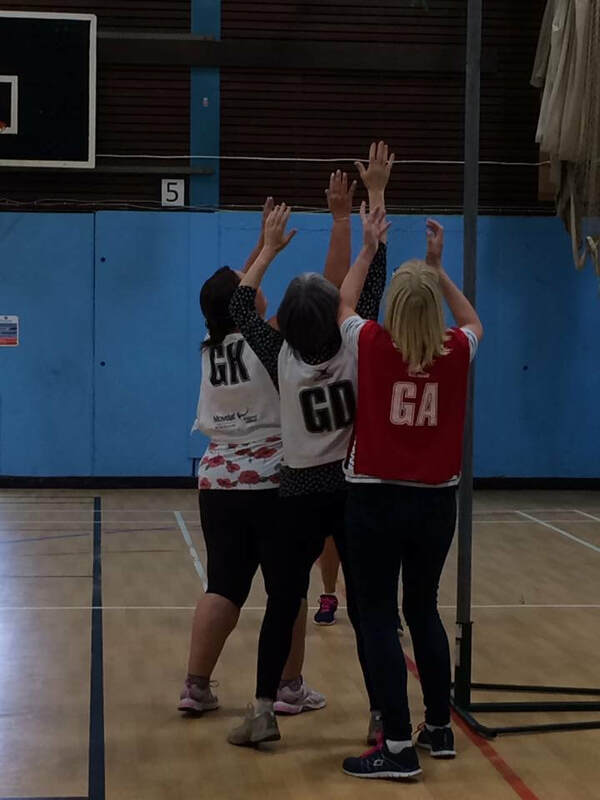 On Thursday 13 members spend an hour experiencing walking netball and what an experience. We all enjoyed ourselves and our couch Ruth from English Netball was brilliant. On March 1st we welcome Thomas Bell to tell us the history of Boots the chemists. We also have a an evening on Tuesday March 13th when Debra Osborn will lead us in a M|indfulness session. Our darts team has had a successful time playing 8 games and winning quite a few of them. Heather Miller and Maureen Harper have won all 8 games they played. Pairs competition is on 5th March were Angela Unwin and Maureen Harper will be playing. Our February meeting is on Thursday 1st. Our speaker is Jeanette Orrey, Former school dinner lady who become Britain's most vocal campaigner for good food for our kids. Sound like we are in for another great evening. 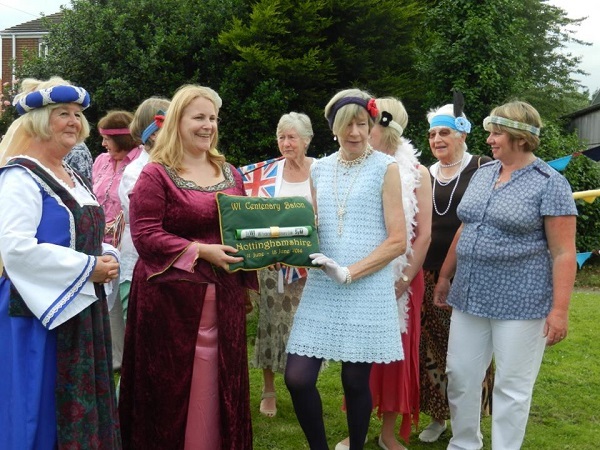 This year Shelford WI will be 90 years old. We have a variety of events planned:- birthday meal, film showing, mindfulness, trip to see Girls the Musical and walks organised by Dinah. Our January meeting will be on Thursday 11th at 7-30pm. It is our AGM were the members will elect next years committee. We are all asked to bring something we made - it can be just made or made at some point in our lives. I can't decide what to take - perhaps one of my daughters!!! 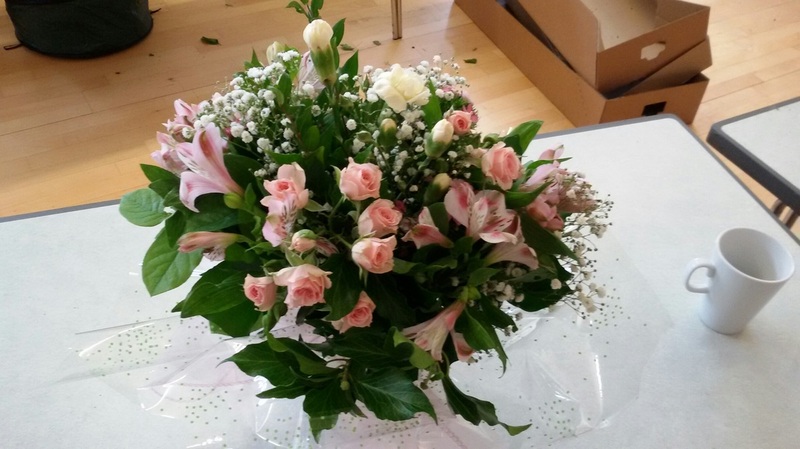 Our members have always proved extremely generous and this Christmas is no exception. We’ve decided to support the work of the Nottingham Women’s Centre. They said the most useful gift they could have would be single-use toiletries, so we set about collecting items for 50 toiletry care bags. Flannels, soap, shampoo, conditioner, body spray, tooth brushes, sanitary wear, shower gel, brushes and body lotion have been donated, and Dent Blanche kindly gave us lots of small tubes of toothpaste. Being the WI, we didn’t want to put them all in plastic bags, so we’ve made brightly coloured drawstring bags from scraps of fabric which, with the help of money also donated by members. 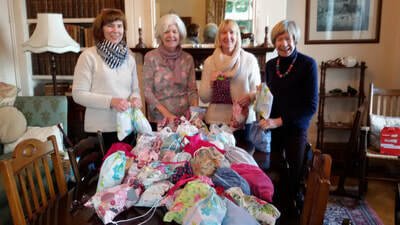 Before Christmas we spent an afternoon filling the bags and they were delivered to a very grateful centre in plenty of time for Christmas and the WI member who has spearheaded the collection and assembly of the items will be equally delighted to have her (very large) table back! Following our visit to Mansfield's Veolia Waste sorting centre last year - our speaker this month was from the same centre - they gave a very interesting talk about waste management. On Tuesday 10 Shelford WI members joined East Bridgford other member of our group for a talk from Medical Detection Dogs. they are a small charity doing very interesting work. They train dogs to use their incredibly powerful sense of smell to detect minute odours associated with many cancers and other diseases. They also train Alert Assistance Dogs to support people with, for example, type 1 diabetes and severe nut allergies, again using their powerful scenting ability to detect tiny odour changes that could indicate an impending emergency. We were moved and inspired by the speaker, who used no notes yet spoke with knowledge and passion about their work. The charity is slowly gaining recognition – its patron is the Duchess of Cornwall and two ambassadors are Jo Malone and Betsy Duncan Smith. As usual East Bridgford made us very welcome with plenty of lovely food and delicious cake. 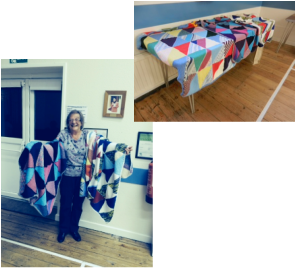 Last month some of our members tried Crochet for the first time under the wonderful instruction of our member Dorothy McPetrie. 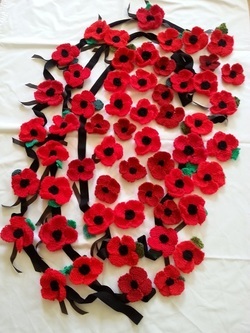 They made a wonderful Poppy. December is our party month so no speaker. We are all looking forward to have an enjoyable evening with fun and food. This month we have been for a walk organised by Dinah Wilcox starting at Gunthorpe Via Hoveringham, Caythorpe and returning to Gunthorpe. It was a lovely sunny day and we walked for 7 miles. 10 ladies and 6 dogs started the walk - 5 ladies and 5 dogs completed the whole walk. We also visited the Anaerobic Digester on 3rd August - this was a very interesting insight into an environmentally friendly method of producing electricity - thank you to Claire Pegg for organizing this event. 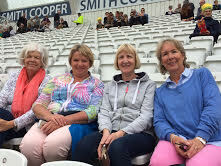 5 ladies attended the Notts Fed trip to T20 cricket - we have a great afternoon and Nottinghamshire Outlaws Won even better. Dinah Wilcox joined others from Notts Fed in a gliding experience. Notts Federation Centenary Fun Day at North Muskham – July 15th. We don’t have a stall but weather permitting there will be something to please everyone. Walk arrangements 20th July. 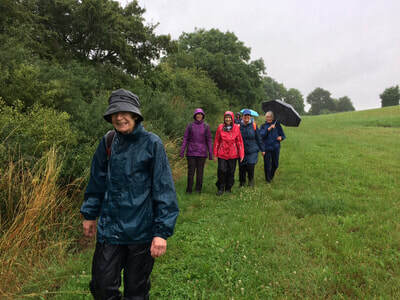 The walk is from E Bridgford to Radcliffe, led by Dinah, about 4/5 miles of gentle terrain, mostly by footpaths or river bank! NFWI Annual Meeting 2017 Ann Keen was our delegate who represented other WIs too. She urges anyone with the opportunity to attend in the future to go, truly inspiring. 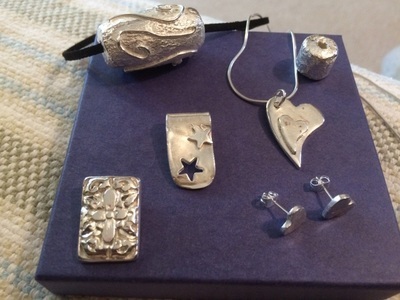 Vacancy on the committee – ‘Try before you buy!’ if joining our committee is an idea you have considered but would like a taster before deciding, you are warmly invited to attend one. Coco Chanel was the topic of this week’s speaker; It was a brilliant evening and we all now know all about her..
Our May meeting saw us voting on this years resolutions, which are Plastic Soup and Alleviating Loneliness. It was a well attending meeting and we were joined by Mary Thompson who explained the resolutions to us prior to voting. On 18th May 2017 we are holding a Mosaic Workshop to make a coaster from glass mosaics 15 members are due to attend. 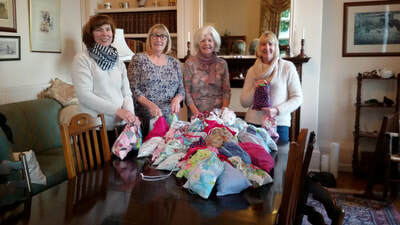 bras, 136 pairs of knickers and about 100 teddies! A fantastic result! Just a reminder: Jo McHugh is still collecting postage stamps and Claire, plastic milk bottle tops, so keep them coming! Carol Lovejoy Edwards gave an interesting talk on the impact of those left behind during the period of the Great War. The talk mainly focused on work the women did during the men's absence. The speaker at our 6th April meeting is Carol Lovejoy Edward talking about The Great War and the impact on those left behind. During March we celebrated our 89th birthday. 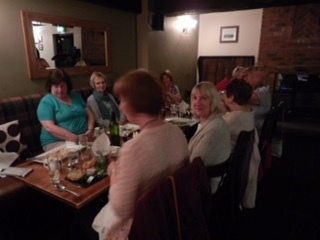 over 30 members went for a meal at the Earl of Chesterfield Pub in Shelford. We are already planning lots of events for our 90th Year in 2018 watch this space. 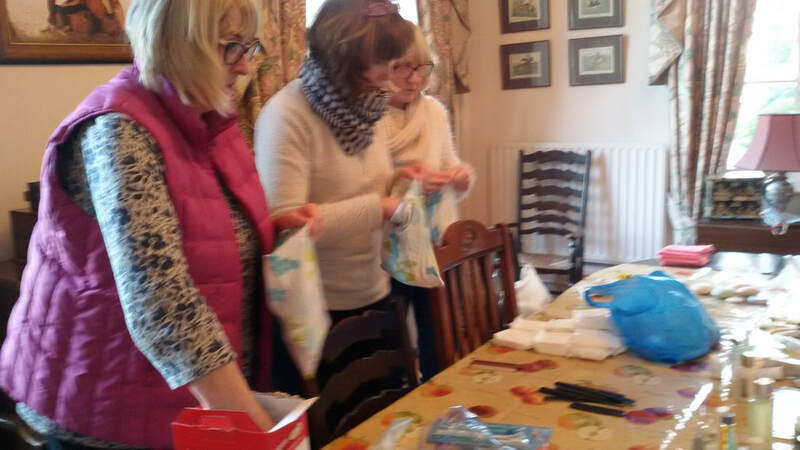 On 28th March 15 members from Shelford WI joined members from surrounding WI's East Bridgford, Burton Joyce and Gunthorpe for the group meeting. It was an enjoyable Murder Mystery evening although nobody guessed the murderer. Thank you Gunthorpe for the lovely food and drink. Our 2nd March speaker is from the Blood Bikes. A UK Registered Charity run entirely by unpaid volunteers. Their aim is to provide an out-of-hours, emergency transport service to the NHS, delivering blood and other urgent medical items between hospitals in and around Nottinghamshire. All welcome. never seen a bear before and were scared of 'Ruddy' Bear at first until they realised that they could cuddle and play with him, then they wanted to keep him. The teachers felt sad taking Ruddy Bear away from the children so promised to return to Uganda and bring each child a bear of their own to cuddle. 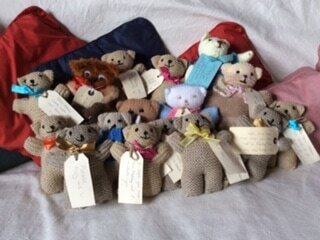 Each bear is sent with a message for the child and £2 to raise money for the Ugandan School. 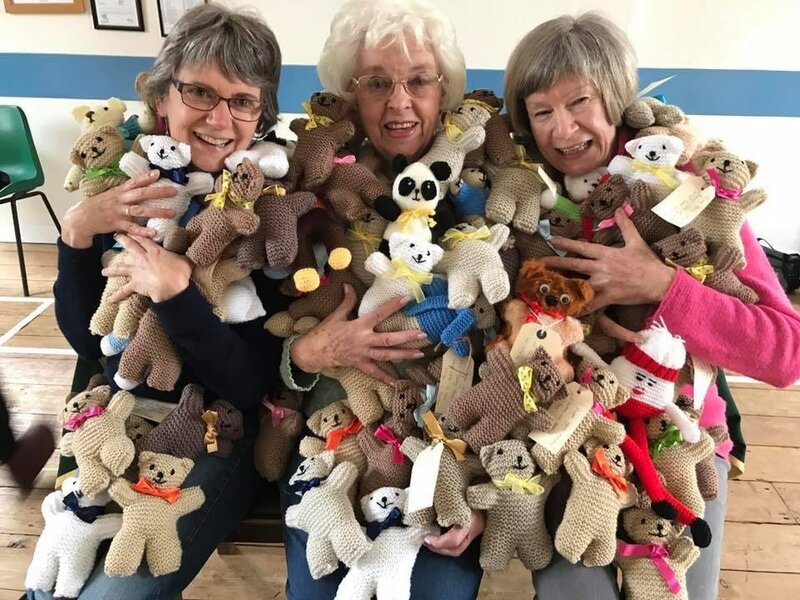 Shelford WI is helping the project by making bears. On Thursday 2nd February St Anns Allotments will be talking to us about Heritage Gardens. 23rd March will be our birthday meal followed on 28th March by the group meeting at Gunthorpe WI. We are also planning on having a craft evening and walk. More info to follow. We started the new year electing a new President at our Annual Meeting no longer called an AGM. We are very pleased to announce that Liz Burr agreed to be our president. After three very successful years under the great leadership of Dinah Wilcox, we now have 53 members. At our meeting Sally Squires talked about a project she and a fellow teacher are undertaking. Last summer they went to teach in Uganda at a school twinned with theirs (James Peacock). They took with them the school mascot, Ruddy Bear. The children hadn't seen a teddy before and were initially a bit scared but then didn't want to give him back. Now Sally has started a scheme whereby people "sponsor" a teddy for £2. 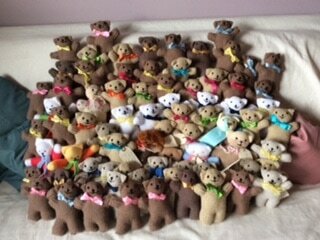 The teddies are being shipped to Uganda for free by DHL, and monies raised will be used to buy water containers for a school where there's no clean drinking water. 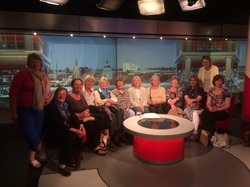 and met with other WI's for our group meetings and darts matches. Members of our committee past and present were lucky to share a lovely meal at Tom Browns for our president Dinah's big birthday. This year was her last year as president and we have to thank her for the great ideas and enthusiasm she brought to our WI over last 3 years. The festive season is fading and the New Year is upon us. Our 2017 programme promises to be interesting, informative and entertaining; John Parker from St Anns Allotments will be talking to us about Heritage Gardens and in April we will hear about The Great War and the impact of those left behind. We are looking forward to a varied line up of speakers from Gorillas to Coco Chanel. Our new year starts on January 12th in Shelford village Hall at 7.30pm with our annual meeting when we elect our new committee. We wish you a happy and healthy New Year. We have had a busy time during October. One evening was spent playing silly sports, we all joined in with Hula Hooping, Bean Bag balancing, Egg and Spoon Races. It was a very enjoyable evening with lots of laughing - members what it to be an annual event it was such fun. 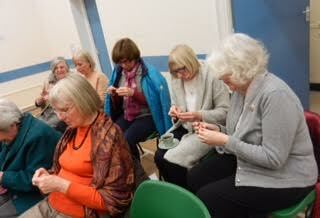 Our meeting night was filled with Shelford WI members giving 5 minute accounts of things that had happening to them. 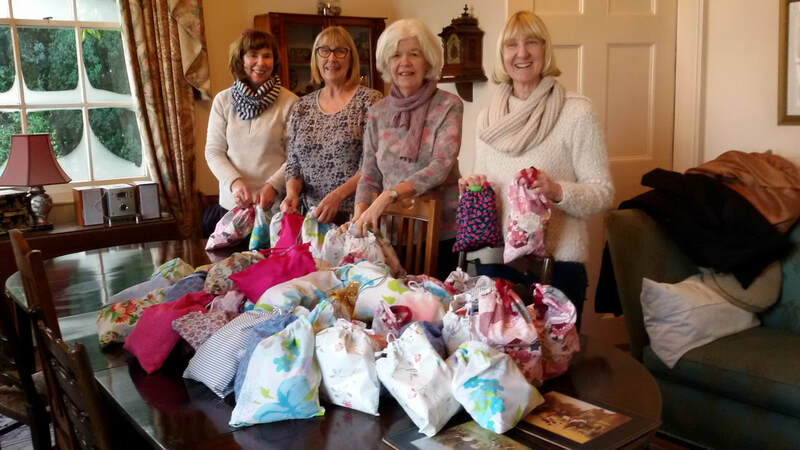 Ranging from Ann writing a book to completed a diamond challenge D of E award, Carol with stories of holiday mishaps, Heathers award-winning beans, Dorothy's exquisite stump work and needle lace. Fiona's quinoa she farms locally. Liz's holiday in Uganda. Liz an insight into life as a nurse. Andrea talked on climate change in WI National Week of Action. Helen lunch at 10 Downing Street to our very own WI Life Cover girl Joy Jordan giving an account of her day at the photo shoot for the article. Our next meeting is on November 3rd as it Dr Martin Hewitt talking about the history of the Children's Hospital. With summer nearly over its back to our monthly meetings. 1st September is our next meeting and the speaker is Tony Mills on Rock Climbing worldwide. After the tour around the sorting centre we were treated to a craft session, we all made a flower from old wool jumpers​. It was a great morning and Veolia encourage trips so if anyone fancies an interesting visit do contact them. Sorry i've not updated our website over the last few months - I should be back to normal by October- til then updates may be minimal. Our member Joy Jordan gave a brilliant talk on her time as a 800 yard runner, during the period of 1958 to 1962. She was the untouchable force of middle-distance running in Britain and joined an elite group of British women who had set individual world records. We were able to see the medals and awards she won along with outfits she worn representing Great Britain. It was fasinating. Our next meeting will be on May 12th at Shelford Village Hall at 7.30pm. The meeting in May is always an opportunity to discuss the resolution being put forward to the National AGM in London. Resolutions form the basis of campaigning and awareness- raising activities in the years ahead. We are hosting the next Group Meeting on Tuesday April 26th – our speaker will be Diana Birch. Diana was an NFWI Trustee and Chair of WI Enterprises as well as Vice-Chair of the NFWI for her last year. She was thus responsible for introducing new lines to the retail arm of the NFWI, for liaising with suppliers, designers and exploring retail outlets such as Waitrose. As Vice-Chair she shared a lift with the Queen during the Centenary AGM. Some of us heard her speak about the WI Cookbook and can testify as to how amusing a speaker she is. I heard her speak about her role as Chair of WI Enterprises and was very impressed with her business acumen. I’m sure she can regale us with “behind the scenes” tales! Plus, a delicious buffet including cakes, scones, fruit kebabs, a selection of sandwiches and smoked salmon blinis – and a celebratory glass to begin! Also, great raffle prizes. litter pick around the village.We retrieved some interesting items. with a delightful selection to goods to purchase. This picture does not do the Pachmina justice. Helen Phillips will give a talk on The Master Craftsmen of Kashmir. Helen has spent time with some of the Master craftsmen and women, whose families have for 7 generations been involved in the hand spinning, weaving and embroidery of the very finest Pure Pashminas. We started the New Year with our AGM. As always we start our meetings by singing Jerusalem. People often ask why Jerusalem was chosen as the WI song. The short version is: The decision to choose Jerusalem came as a result of a letter to Home and Country (the WI magazine), prior to the 8th national AGM, from Vice Chairman Grace Hadow suggesting its use. The NFWI ran a competition for an 'Institute song', hoping that it might produce a good but unknown poet. Many poems were sent in but nothing suitable was found; it was after receiving a verse that began, 'We are a band of earnest women' that Grace Hadow, the Vice-chairman, suggested that Jerusalem should become the WI song. Jerusalem had been used by the National Union of Suffrage Societies in the 1918 celebrations of women's enfranchisement. Many of the leaders of the NFWI had been part of that struggle to win the vote for women. The rest is history. 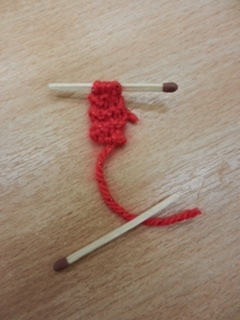 At the end of our January meeting we amused ourselves by knitting with match sticks; it might be a while before we finish the jumpers though. We will be singing Jerusalem again at Shelford village hall on February 4th at 7.30pm. Our speaker will be Helen Phillips talking on: ‘Towards the Himalayas’ – sounds like another ‘earnest woman’. Our next meeting will be the Christmas party, this year we will be playing games along with eating a variety of food provides by all our members. We are still in contact with Matakana WI, a small group in New Zealand and will,as usual , be exchanging Christmas gifts with them. Today two of our members are off to London to visit WI HQ - looking forward to finding out more about the work of a London based HQ - and where our subscribions are used. Last Thursday we hosted a pamper evening in aid of the Nottingham Section of the Teenage Cancer Trust, our members enjoyed an evening of various treatments from nails to Reiki. It was a very socialable evening ending with a raffle which was mainly donated fom local companies. The evening was helped along by a very kind donation wine from The Staunton Arms. The evening was a great success and raised over £828 for the Trust. At our November meeting we were entertained by David Brailsford a member of a the newly formed storytelling group which consists of an amalgamation of the Nottingham and Derby storytellers. He regaled us with amusing stories of Egyptian holidays, monks and burials. ​very interesting and informative talk. Next month is our Christmas Party. After the summer break we were entertained at our September meeting by Voice Versa; a group of ladies reading poetry and prose. We were treated to a selection of readings, written by some familiar names, some comic, some tragic and some very saucy offerings. 15th September saw 9 of our members have a very enjoyable evening at Radcliffe WI. 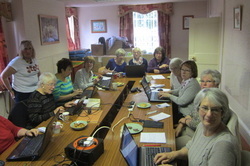 They very kindly opened their meeting to guests from several WI's. We were treated to an interesting talk on Women and their lives in 1915, followed by tea and very yummy scones with jam and cream. Thank you Radcliffe WI. On 26th September we are holding a joint Tea Party with East Bridgford WI at their hall 4-6pm to celebrate the WI centenary. We will be entertained by committee members from both WI's with the history of the WI and enjoy tea and scones. 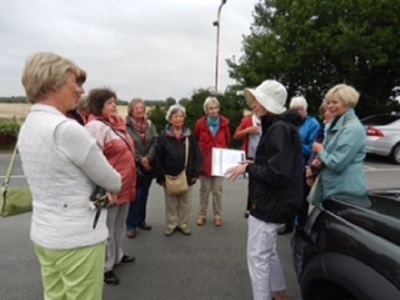 In August, as we dont have a meeting, Dinah kindly arranged a walk around the village. It was a very informative walk where we learnt some of the fasinating history of Shelford. Our walk was followed by a meal at the Earl of Chesterfield. Everyone enjoyed the evening. Nottinghamshire WI Weekend at Denman College. Shelford WI Members - Pat Thompson, Dinah Wilcox and Maureen Harper joined approx 80 Nottinghamshire Ladies for a brilliant weekend at Denman College. We travelled down on Friday afternoon for a weekend of fun and laughter. We each attended a different course. Singing, Flower Arranging and Silver Clay Jewellery. The rooms were very comfortable and all ensuite, the food was great and the company couldn't have been better, wine flowed as did the chatter. On Saturday night we were entertained by the singing group with included Dinah, they were very impressive after only one day of signing together. Dinah then did a quick change and had us all laughing and clapping at her workhouse sketch - we have a very talented President. The evening ended with a slice of delicious cake made and iced by Jane Jefferson, Nottinghamshire Federation Chairman - another very talented person. 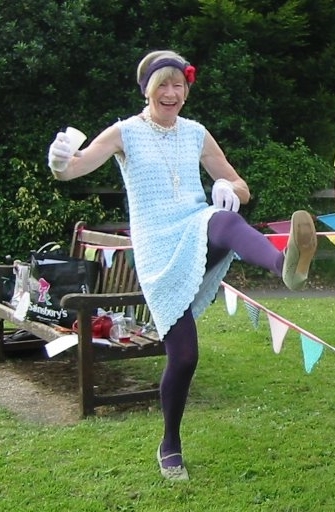 We have to thank Mary Thompson and the other trustees for all their hard work in organising such a fantastic weekend. 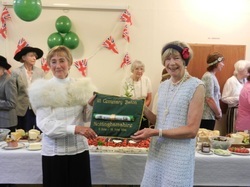 Shelford WI was lucky to have two of our members picked to go to the Garden Party. the Royal family. We set off armed with fascinators and dressed in our Sunday best. keeping our fascinators under control in the high winds. As part of our Centenary year we are doing a Challenge to do 100 new things. Eight members were lucky to drive a tractor, we had a brilliant evening thanks to James and Carole. sit on the red sofa. Shelford WI is now 87 years young and not doing badly for our age, we never miss the opportunity to celebrate with a good meal. We continue to challenge ourselves; in the WI’s hundredth year we are attempting to complete 100 challenges to go beyond our comfort zone. Singing at the Albert Hall in Nottingham and driving a tractor feature amongst these. Every Spring we attend the Nottinghamshire Annual Meeting which takes place at the Royal Centre. This year we were treated to a visit from our national chair, Janice Langley and historian Ruth Goodman. Ruth has appeared in many BBC educational documentaries such Victorian Pharmacy and Wartime Farm. She told us about the life of ladies living in rural areas at the time that the WI started; no running water, outside toilets and isolation, to name but a few of their challenges. The WI has always fought for women’s rights as well as national and international issues. We continue to campaign for improvements. 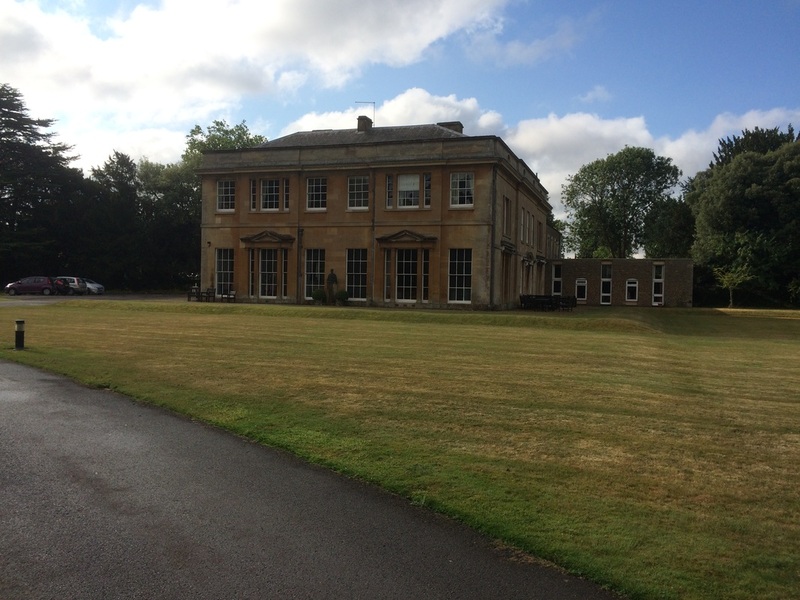 At our next meeting in Shelford village hall on May 14th at 7.30pm, we will be talking about the resolution to be discussed at the annual meeting in the Albert Hall in London. last night. Brilliant night - thank you to Notts sports and leisure for organising it. In order to celebrate the centenary of the WI we started to research the minutes of our own WI’s history. Wow, what an amazing set of ladies .Their exploits and courage made us feel quite insignificant. In hard times these ladies kept the country going. They ferried planes around in the 2nd world war. They provided eggs and potatoes for the hospital. In 1942 they helped to make the 300,000 tons of jam needed to cover the rations. That’s a lot of fruit picking. In the late 1940s and early 1950s they had a surprisingly international flavour to their lives: they entertained students from Scandinavia, Greece and France; they sent periodicals to German women in the late 1940s. They also constantly received cake and tins of dripping from Australia. I hope it was fruit cake as the journey would have taken some time. In 1945 they responded to an appeal for help for the Women of France. The National Federation of WIs have produced a cookbook this year called, ‘The First 100 Years.’ So the story continues. At our meeting on April 2nd Gabrielle Middleton will give us a taste of belly dancing. How times have changed. By March we hope that spring will be on its way. According to one quote, ‘Spring is when you feel like whistling even with a shoe full of slush’. We look forward to that. At our meeting Ginny McGivern will be talking to us about, ‘ Complementary Therapy and Massage’. Professor David Walker from the School of Medicine at Nottingham University talked to us about teenage cancer at our last meeting. It is saddening to think that around seven young people aged between 13 and 24 are diagnosed with cancer every day in the UK. He works with The Teenage Cancer Trust who provide expert treatment and support from the moment the young people hear the word ‘cancer’. We are looking forward to tomorrow evenings talk on the Teenage Cancer Trust. Happy New Year everyone. With the party season behind us - our AGM on 8th January starts the New Year. Shelford WI has a broad and varied programme of events planned for 2015 from belly dancing to talks on Bess of Hardwick, the teenage cancer trust and complementary therapy. If you would like to join us, you are more that welcome at our monthly meetings. They are held on the first Thursday in the month apart from in January and May when its the 2nd Thursday with no meeting in August. 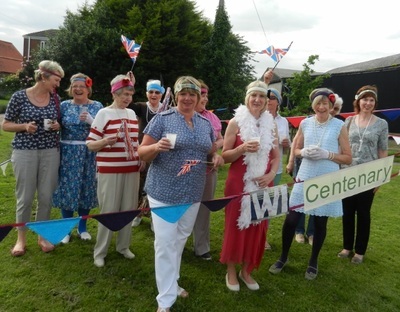 The Women’s Institute was formed in 1915 and celebrates its centenary this year. It was formed to revitalise rural communities, encouraging women to become more involved in producing food during the First World War. Since then the organisation's aims have broadened and the WI is now the largest voluntary women's organisation in the UK. The Christmas party was a great success: staring with mulled wine and lovely food provided my our members. We were well entertained by Ring Out Wild Bells who made our evening complete. 12 guests from East Bridgford, Gunthorpe and Burton Joyce joined us for the wonderful evening of food, wine and laughter. Our thanks also go to the washers up it was lovely to end the evening with no washing up to do. Everyone's support is urgently needed to prevent gravel extraction in Shelford from going ahead. If this does go ahead we would loose our beautiful scenery, local farming businesses and peaceful countryside. The lovely riverside walk from Radcliffe to Shelford lost and years of disruption from gravel extraction and the movement of gravel onto our local roads, mainly the single carriageway A6097 which is already very busy. To find out more information go to their website - they need your help. Jenny Ellis from the Chocolate Box in Radcliffe gave a wonderful insight into the history of chocolate. She explained the process from picking the pods to tasting the end product. A talk and tasting very much enjoyed by all. and inviting us to sample her product. She will have a selection of chocolates for sale. The Chocolate Box sells divine handmade chocolates from its shop in Radcliffe. Everyone's heard of the Sheriff of Nottingham on Thursday we will learn the role of the High Sheriff? On October 2nd, Nicky Weston will tell us all about her year as High Sheriff. £3 for visitors. Following last years successful fashion show, we are holding another on Friday 12th September at 7.30 pm, tickets are £5 including a glass of wine. SD Fashion Show Co Ltd are again running the event, they always have a variety of brands at bargain prices. All are welcome so please bring a friend. Tickets are available from Dinah, Ann or Pat. any spare tickets will be available to purchase on the door. This months speaker is Patsy Rayner, Talking about the role of the natural world and garden in Japanese life. Patsy has family in Japan and is a frequent visitor and fluent Japanese speaker, as well as a gardening expert. Her illustrated talks have proved immensely popular in the past. Thursday 7th August was a sunny evening when Heather led us on a very pleasant walk through her fields, past the wonderful display of knitted poppies on the war memorial arriving at the Earl of Chesterfield ready for our meal. It was a lovely evening enjoyed by 12 members. 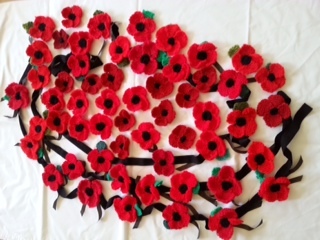 Members knitted 100 poppies, Pat has been busy sewing these onto ribbon. 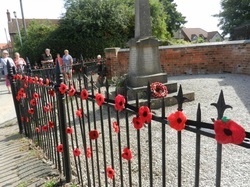 On Monday 4th August several members decorated the railings of the war memorial in Shelford with these poppies. 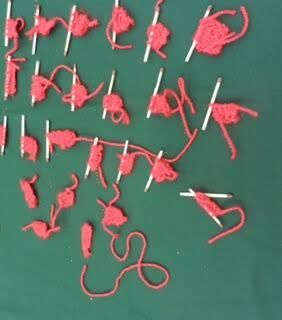 Following our success knitting bunting to decorate the Millennium stone, members are now busy knitting poppies to decorate the railings around the War Memorial. 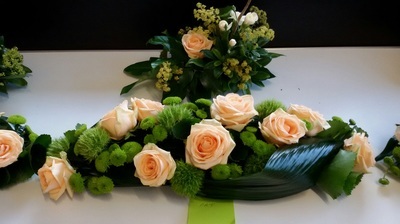 We were hoping in this way to commemorate the centenary of WW1 on August 4th. 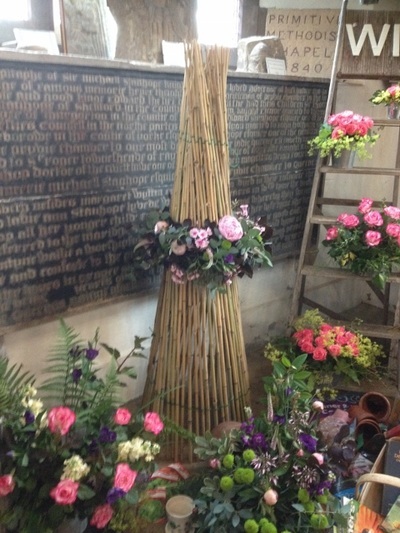 Pat, Dinah, Heather and Maureen spent Thursday morning creating the Shelford WI arrangement for the Flower Festival. Find more photographs in our gallery. We enjoyed a brush with history in the form of the Workhouse Storytellers who regaled us with tales from life in the workhouse. From piss pots to the devil’s hand, we learnt about their sorry lives and Matron’s struggle to keep them all in order. Don’t miss the July meeting, on Thursday 3rd,, we will be entertained by the Workhouse Storytellers from Southwell. 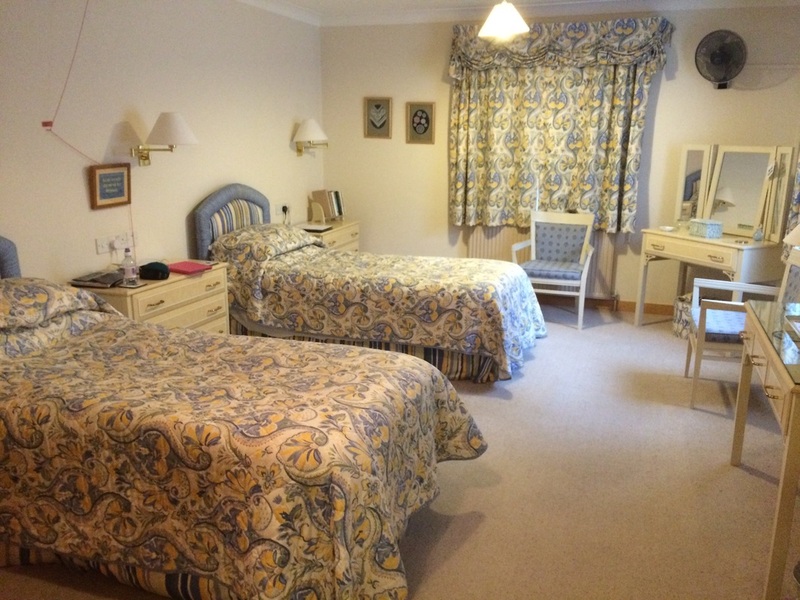 Matron, the Porter and some of the paupers will relate stories of their lives; humorous, thought-provoking and always based on archival records. 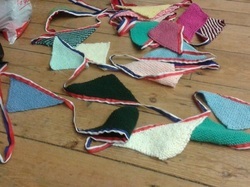 The evening started with Shelford members decorating the area around the Millennium Stone in the village with knitted bunting. Pimms was plentiful and fun was had. At 6.20pm we received the Baton from Bingham Belles 11 members caught the bus from Shelford to East Bridgford singing songs on the journey, much to the surprise of fellow passengers and the driver. Two East Bridgford WI ladies greeted us at the bus stop, leading us to their WI Hut. Our evening was complete when we were wined, dined (in true East Bridford style) and entertained by East Bridgford WI. A wonderful evening was had by all..
Our next meeting is on 3rd July when we will have a visit from the paupers and Matron at the National Trust’s Workhouse at Southwell. The Workhouse Storytellers will take us back to the 1840s and entertain us with tales of workhouse life. 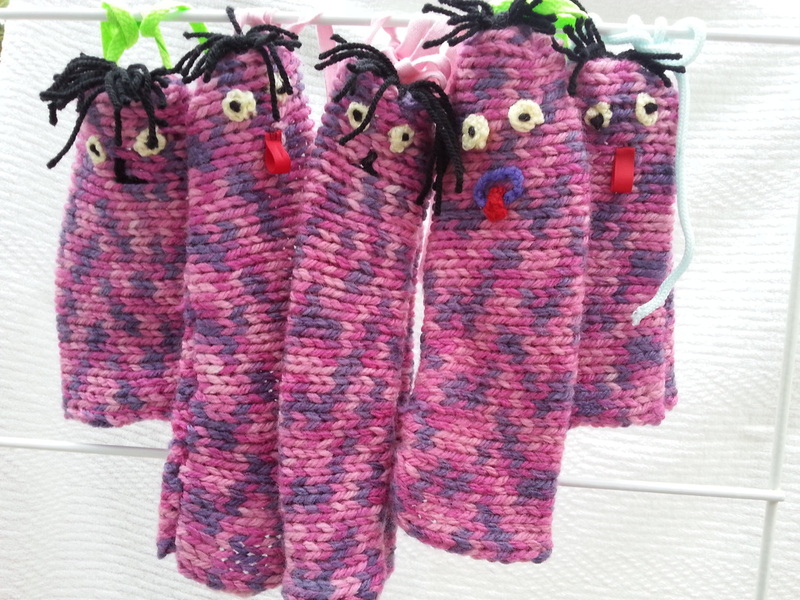 Our knitted family are getting excited about their trip to Shelford on 13th June to hand over the baton to East Bridgford WI. At our June meeting Carole Kirk kept us enthralled with pictures of her climb up Kilimanjaro and to Everest base camp. She succeeded in overcoming a variety of hazards and challenges, not to mention flying into the world’s most dangerous airport. We look forward to the meeting on June 5th when Caroline Kirk will be talking to us about, ‘ Climbing Kilimanjaro’. 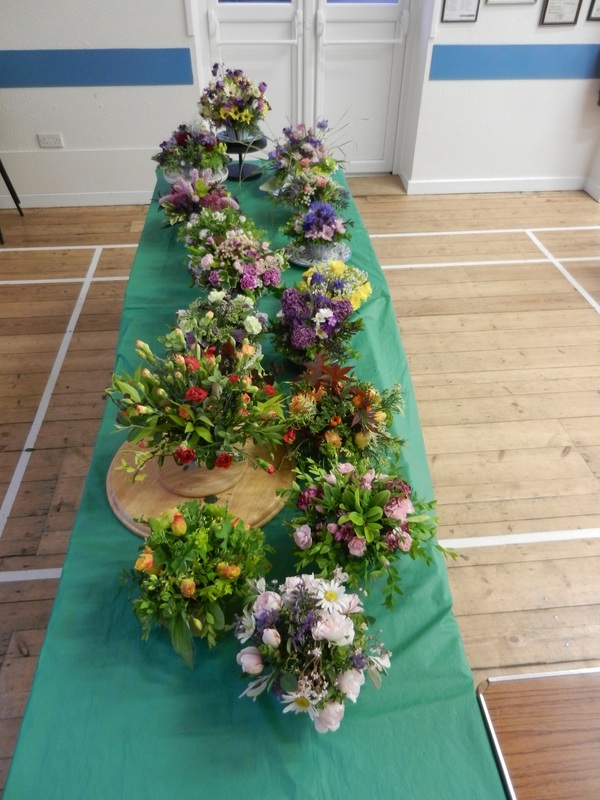 16 members last night had a wonderful evening creating a flower cup cake arrangement, armed with ‘cupcake containers’, oasis and armfuls of colourful flowers and under the expert guidance of Ruffy(Rosemary) we made lovely creations representing the wealth of spring flowers available. This picture shows the finished arrangements which are all very different. The special centenary baton is being passed around every federation within England and Wales during 2014-15. The last stop on the route will be the Royal Albert Hall where the centenary Annual Meeting will be held. On June 13th Shelford WI will receive the Baton from Bingham Belles WI and pass it on to East Bridgford WI. At our May meeting we discussed the National WI’s resolution, "We call on every member of the WI to make their wishes regarding organ donation known, and to encourage their families and friends, and members of their local communities to do likewise." On a more cheerful note we ended the meeting with a sing song. Under the patient guidance of Kay Brown we created this wonderful website today. Have a look and see what we have been up to. Shelford WI members are creating knitted bunting in abundance. Des Coleman obviously felt at home when he entertained us with tales of his colourful life at our Group meeting. He has appeared in numerous stage musicals and played the role of Lenny Wallace in BBC's EastEnders. In 2007 he became the weatherman for BBC's East Midlands Today and now works on shows such as The One Show. With a blend of anecdotes, jokes and impressions he made us laugh 'til we cried. All the lovely food ready for the guests to arrive. We meet on the first Thursday of every month in Shelford Village Hall on Church Street. The meetings start at 7-30 pm.